Juicy interior, crispy skin—nothing beats a barbecued fresh sausage. It’s no secret that barbecuing is one of the most popular ways to prepare sausages. With good reason. The high heat and smoky flavors that charcoal provides makes for a crunchy, juicy, meaty barbecued treat. Here we will explore how to properly barbecue these raw, fresh sausages, like Italian or bratwursts, that are always the first thing to go at any cookout. The process is easy and takes only five simple steps. Set up your coals in a two-zone configuration. 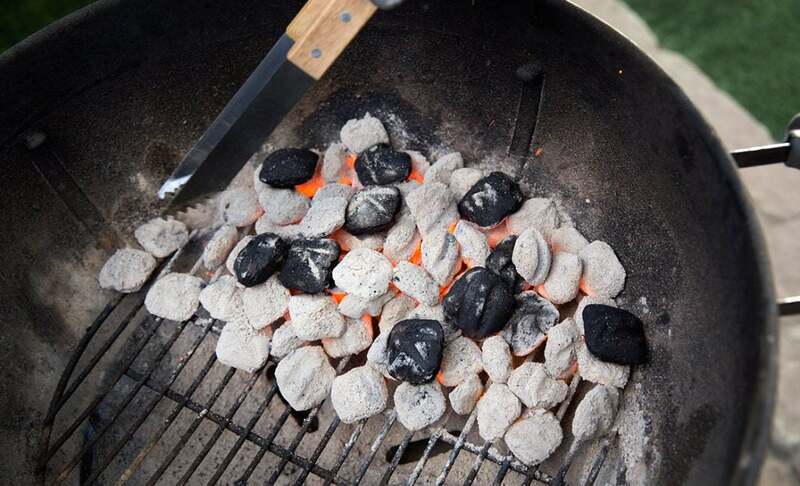 Light your coals and pile them all onto one side of your BBQ, leaving the other side empty. You’ll need both sides of the BBQ and both levels of heat to barbecue the sausages properly. The best way to cook sausages is by employing a reverse sear—which means cooking the sausages almost completely through before searing over high heat. 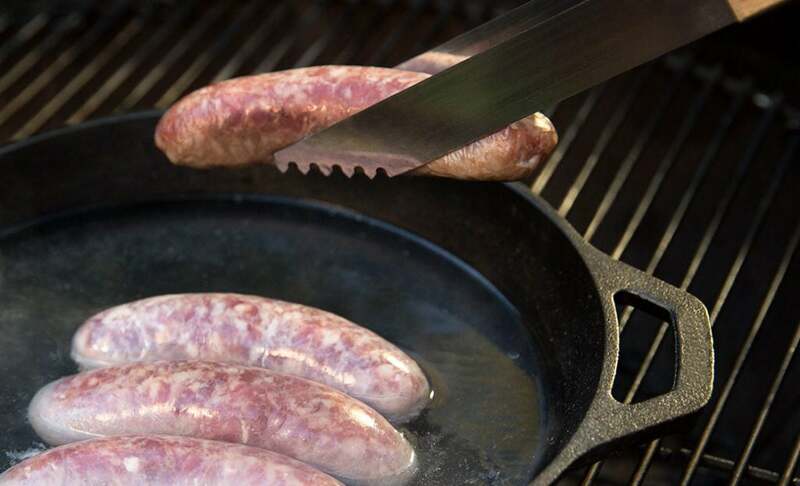 Simply place the uncooked sausages onto the cool side of the BBQ, putting the lid on and letting them cook for about 10 to 15 minutes or until they approach the desired internal temperature. Cooking fresh sausages means the casings fill up with delicious juices as the meat inside cooks. To keep your sausages juicy, do not move them using a fork. Whenever you pierce the skin, those valuable juices can leak out. Use a pair of long-handled tongs to move and rotate the sausages from now until the end of the cooking process. Once nearly cooked through, it’s time to sear your sausages to get that coveted crispy skin and those grill marks. If you started them on the cool side of your two-zone fire, simply move them over to the hot side. If you cooked them in liquid first, move the pan over to the cool side and remove the sausages, placing them directly over the coals. Once searing, watch them closely and rotate them so they don’t burn and so you get nice grill marks on all sides. Just like with a steak, you want to let your sausages rest for a few minutes prior to slicing or serving them. After all, you worked so hard to preserve those juices, it’d be a shame to let them go to waste draining out on a cutting board. 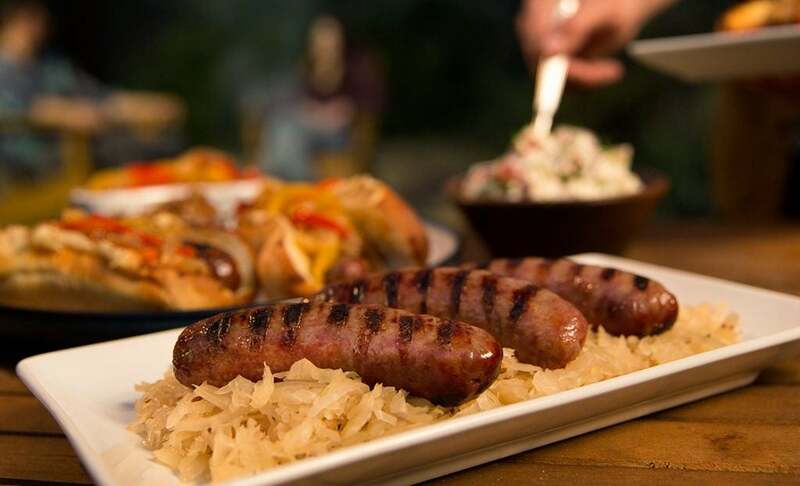 Sausages are great on a bun or served on a platter with sauerkraut or sautéed onions and peppers.